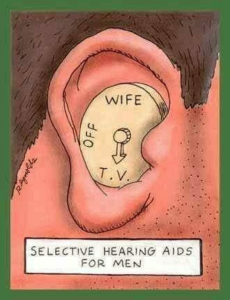 My wife says “You never listen” is it selective hearing? Many of us have immense opportunities through our communication at home. Do we or do we not communicate with our spouse, kids or loved ones? Are we engaged in a conversation? Meaning are we listening closely or are we thinking of what we already are going to say? Workplace communication has become less face to face conversation and more email/texted. At what point can we say we have conquered effective communication. 1) Roleplay: Management/Employee Engagement. How do we communicate effectively with teammates? Have fun! 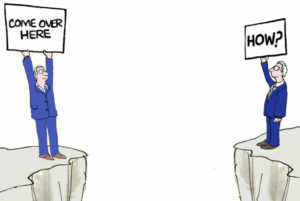 Reverse roles of management and employees. 2) Open Forum: Breakout into smaller groups with the involvement of a lead employee facilitating. The objective is to solve safety-related concern within the work area(s). The first group to take action solving the problem wins! 3) Management Engagement: A routine walk-through once a week actively engages the employee’s questions/comments or suggestions. Respecting the employee and improves overall relationships with management and employees. Whatever the decision is to improve communication, it is an essential part of a great organization. Engagement of the employees instills change, encouraging innovation, ensuring a safe workplace, assisting with conflict resolution and contributing to the overall success of the company. One sign reads ‘Come over here’. The other reads ‘How?’.